UNDERNEATH IT ALL, A-List celebrities are just like the rest of us. Sure, they’ll rock up to the Academy Awards this Sunday looking flawless and fragrant and like their poos resemble tiny Maltesers that smell like the Body Shop, but we all know that’s not true. Behind the glitz and glamour of the red carpet, we want to know what goes on where the real action happens at the Oscars… in the bathroom. The Oscars is a live broadcast, so the last thing the producers want is stars who have ill advisedly broken the seal getting up and down like a fiddler’s elbow to go to the jacks. While there are seat fillers employed there are still restrictions on when people can leave their seats. Time your toilet needs so that you can get to the bathroom and back before the telecast continues, or you won’t be able to get back in until the next commercial break. This phenomenon isn’t particular to the Oscars either. A Buzzfeed employee witnessed the luminous Kate Beckinsale waiting to take her seat after a bathroom break at the Golden Globes. Even the luminous Kate Beckinsale has to wait. Imagine Benedict Cumberbatch desperately trying to get back to his seat in time for Best Actor after rushing out because he was BURSTING, only to be told he has to wait. Morto. Yep. Every year hundreds of people are employed to fill the seats of those toddling off to the toilet. They’re paid a small fee, but have to provide their own tuxes and dresses. I found myself next to a man who said he was enjoying his night “apart from all the getting up and down”, so I assumed he was a seat-filler, too. I asked him if he had got any good ones so far — meaning star sit-ins — and he said yes, one or two. I then told him that I’d almost done Nicole Kidman and was waiting to do Orlando Bloom. He looked at me strangely — and then I realised he was Elijah Wood. He’d been up and down getting Oscars for Lord Of The Rings. I blurted out: “You’re not a seat-filler — you’re a Hobbit.” He made his excuses and left. Does Dame Helen Mirren have to queue up with Jennifer Lawrence and Jared Leto’s mam in order to spend a penny? Do Samuel L Jackson and Jack Nicholson have to observe the rules of the urinal? It seems that when it comes to the Oscars, the bathrooms are a bit of a free for all. Previous nominee and attendee in 2011 Michael Creagh told DailyEdge.ie that the Dolby Theatre, where the awards show is held, is “nice, but it’s just a big theatre”. So whichever one is closest to you, that’s the one you use. On one trip to the men’s room Creagh ran into Hurt Locker actor Jeremy Renner, nominated the previous year for Best Actor. It was just inane small talk, something about the bar I think. If I knew anything about American football we probably would have talked about that. Nominee and attendee Juanita Wilson (nominated in 2010 for The Door) told DailyEdge.ie meanwhile that “everyone is friendly” in the queue for the bathroom and that “some are more dazzled by others” by the celebs. Not only does everyone pile in together at the Oscars when it comes to the bathrooms, they’re also a place where there might be no escape, if you really have to go. Your work inspires me like no one else. If you’ll excuse me, I’m going to get into there before someone else does. In 2007 Mark Walhberg revealed that he had used Ellen’s own private Oscars bathroom while he was knocking around backstage. According to Mental Floss Colin Firth nearly lost his Oscar for The King’s Speech in 2011 after leaving it on top of a cistern. Firth had to be chased down by a bathroom attendant, who had found the 8-pound statuette in the bathroom stall. “Excuse me,” says the young woman in the striking red dress. Sarah Paulson, busy fixing her eyebrows in the bathroom mirror slowing turns her head to see her 12 Years a Slave co-star Lupita Nyong’o standing at the sink next to her. They may have played slave owner’s wife and slave on screen, but these two proved to be thick as thieves in the bathroom, where they began screaming like two young school girls when they saw each other. We can’t help but wonder which celeb was standing over that toilet, silently mouthing and pleading “please go down, PLEASE go down”. 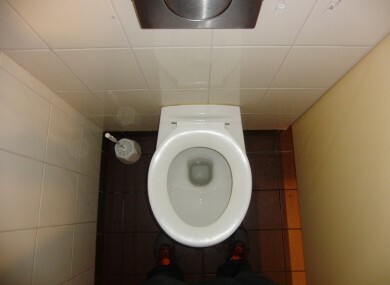 Email “8 things you need to know about the toilets at the Oscars”. Feedback on “8 things you need to know about the toilets at the Oscars”.